Kenneth Branagh’s live-action Disney remake of Cinderella jumps on the fairy tale retelling bandwagon with and at this point I just view films like this with a permanent shroud of cynicism because it is all about the Benjamins in the end because save for a few well shot scenes infuse with gaudy finery by Branagh, I never felt like I was receiving a novel and imaginative experience from this story like Maleficent but it will rake in the money for sure. You could argue the most important part of this film is the short film preceding it, Frozen Fever, which continues in the build up to the sequel to the much loved Frozen. In fairness it’s probably best to keep it safe because the original Cinderella Disney classic is much loved and I had it on VHS so there were times I was watching it 5 times a week so I may not like to admit but I do have fond memories of it and if the director had dropped the ball I may have gotten quite petty. Branagh writer Chris Weitz do tread carefully with some reverence (or repetition depending on how you see the glass) for the 1950 original with a few additions and twists and they even try and fail to get the CGI mice along with Lucifer the cat involved. We meet a young Ella early on and she lives quite happily with her parents on their estate with the aura of green substinence and fresh meadows in the backdrop but we know orphan Cinderella and we wait patiently for tragedy to strike this joyous home and before long bumbling and quirky sisters, Anastasia and Drisella (Sophie McShera, Holliday Grainger) with their mother, Lady Tremaine (Cate Blanchett) enter the fray. At this point we are in more familiar territory and the checklist can come out as we inspect rather than try to enjoy what Branagh serves up unless you have not seen Cinderella before in which case this film may end up being quite enjoyable. 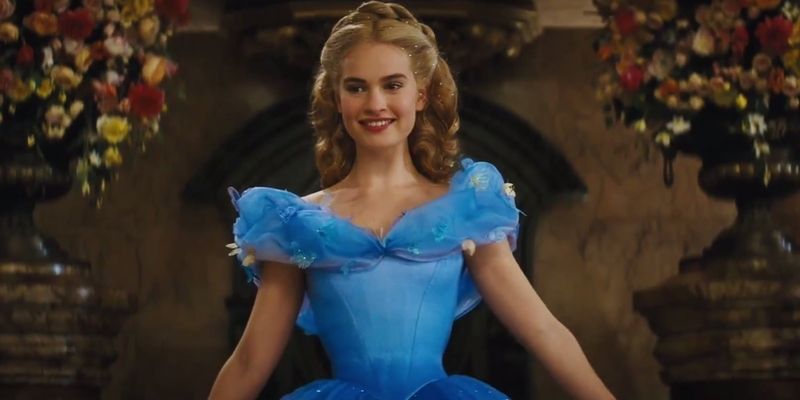 Thankfully he does give the Disney hardened some things to take in like the character of Ella played by Lily James who brings tremendous likability which elevates the film. She is just beaming with humility, kindness and a general unpretentious innocence and she never once steals a wrong glance at her step family that mistreats her. It would take a stone heart dripping with tar to not like Ella but it would appear that is just the kind of heart beating in Lady Tremaine’s chest. Cate Blanchett brings all the conceit and ominous venom necessary for the trope of the wicked step mother with the disconsolate aesthetics to match she makes grief trendy. She almost always has a chasm of darkness enveloping her as she imposes her will on Ella and the household in a throwback to the step mother tropes of Ghanaian films some 15 years ago. Ella on the other hand glows and threatens to just start oozing pure honey from her skin and when Helena Bonham Carter shows up as the fairy Godmother to pimp her up for the ball she just becomes stunning. You can’t fault Prince Charming (Richard Madden) for wanting her which basically all he does in this film. Writing this I realize I cared nothing for the plot which did tick a lot of the boxes from the original even to the point of the mice saving the day. We feel some original humor and Branagh does raise his game from behind the camera in the glorious ball room sequence has he prances round in regal splendor and captures all magic and grace and delivers the best and most glamorous moment of the film and probably the only improvement but still i say give me the 1950’s original any day. It is largely flashy nuts and bolts fare that spirals towards the “happily ever after” ending we expect and i don’t know if may end up being as timeless as the previous version. I had wanted to whinge about the complete absence of music but maybe that’s pushing it.